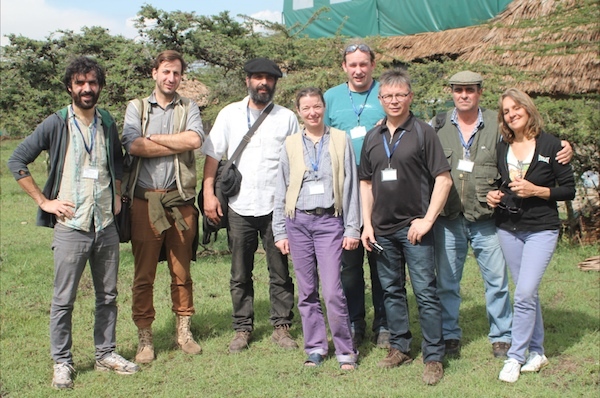 Several shepherd councilors of the European Shepherd Network (ESN) project and other representatives of European shepherd organizations have met in Kiserian, Kenya to constitute a European delegation at the Global Gathering on Pastoralism jointly organized and hosted by IUCN (International Union for Conservation of Nature) and UNEP (United Nations Environmental Program). From December 9th to 15th 2013, the event gathered 120 pastoralist leaders representing communities in 48 countries worldwide in Kiserian, Kenya, to share experiences and concerns. Echoing the Kassel encounter in June 2012 on the situation of shepherds in Europe, several pastoral delegates have met and represented the European region at the international gathering on pastoralism in Nairobi, Kenya, from 9 to 15 December 2013. Shepherd representatives from France, Germany, Italy, Netherlands, Spain and Sami people attended the meeting. During this gathering aiming to discuss global issues of pastoralism and indigenous nomadic people*, a need arose within the European delegation to establish a network that unites, coordinates and supports the struggles of unions and organizations at the European level. Inspired by the alarming stories of landgrabs of millions of acres shared by East-African participants, the European feeling was that beyond national frontiers, we face common struggles that bring us together. First comes our fight against anti-pastoral bureaucracy and the multiplication of laws that favor private agribusiness. All over the continent, we organize to defend ourselves and fight against the same European policy, from electronic identification to the conditions of the Common Agricultural Policy (CAP) and of its upcoming reform. Such priorities demand that we act quickly and together at a European level: in particular, the 2015 law project in France on genetic selection could hit other countries, in the line of patenting and privatization of seeds. The problem of predators, wild fauna, environmentalist and health policies are further issues that push us to act together, across national borders, through a strong and united movement. All these struggles are as many opportunities of joining forces and support the values that we share in order to find solutions. Concretely, our proposal is to come together and organize ourselves into a European network that would be a tool serving its member organizations and collectives. The objective is to encourage exchange, strengthen transnational connections and create federative events. We aim for a diversity of potential actions as long as they align with the preservation of the shepherd way of life. The intention is to coordinate independent actions, which does not prevent us from forming alliances – the European policy we struggle with targets other groups, we are not alone to fight against the rise of control. This project of a European Shepherd Network can only be collective. Your feedback by email on this intention note would be very useful. We plan on organizing a large European gathering together with an impactful action in 2014, notably to anticipate the 2015 CAP reform and come up of with collective solutions rather instead of everyone suffering its consequences on their own. The other key issue would be to agree on a legal structure that would provide this network with a formal existence. Everywhere in Europe, public opinion tends to support shepherds. We must take advantage of this current sympathy for our way of life and our struggles and show that beyond defending our values our action contributes to a larger reflection about alternatives to neoliberal Europe.